Bloomberg News, The Wall Street Journal and ProPublica won gold, silver and bronze awards, respectively, in the 12th annual Barlett & Steele Awards for Investigative Journalism. 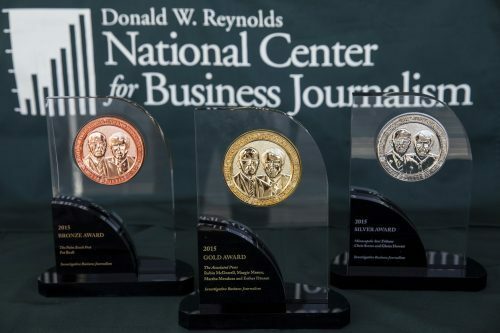 Bloomberg News, The Wall Street Journal and ProPublica won gold, silver and bronze awards, respectively, in the 12th annual Barlett & Steele Awards for Investigative Journalism, the Donald W. Reynolds National Center for Business Journalism announced today. Named for the renowned investigative team of Don Barlett and Jim Steele, whose awards include two Pulitzer prizes, the annual Reynolds Center awards celebrate the best in investigative business journalism. GOLD: “Brexit’s Big Short” by Cam Simpson, Gavin Finch and Kit Chellel of Bloomberg News exposed how a handful of hedge funds netted hundreds of millions of dollars in the largest major currency crash in the modern financial system, tied to the Brexit vote. While U.K. law restricts pollsters from releasing exit-poll data before voting ends, secret exit polls purchased from leading pollsters provided non-public, market-moving data that revealed how Britons voted. This put some funds in position to earn fortunes short-selling the British pound, while others secretly bought access to polls before they were published in the press and offered trades. Nigel Farage, the global face of Brexit, gave what sounded like a concession speech of a Brexit failure within seconds of the close of voting that pushed the pound upward, ripe for the stunning collapse that pollsters and those hedge funds knew was coming. “This is a great business investigative story of powerful financial firms infiltrating politics for pure financial benefit,” said the judges, noting that the story was headline news in media around the world, angering citizens and prompting U.K. Parliament inquires, with much more sure to come. SILVER: “The Investigation of Michael Cohen” by Michael Rothfeld, Joe Palazzolo, Rebecca Ballhaus, Peter Nicholas and Alexandra Berzon of The Wall Street Journal. They began their string of exclusives by uncovering the $130,000 paid for silence to adult film star Stormy Daniels from candidate Donald Trump a month before the 2016 election. They followed up by revealing a $1.6 million settlement for a top Republican fundraiser and the exposure of Cohen’s D.C. shell company that he pitched as an entrée to the President. Another story provided details of Cohen’s often turbulent relationship with Trump, who came to doubt the attorney’s professional abilities and judgment. Unlike many investigative projects, this one did not begin life as a planned series but instead grew organically as the reporters amassed exclusive after exclusive. “We had known a piece of all this, but just a piece, that didn’t attract a ton of attention at first but these reporters got the scoops that led to a serious turns in the investigation as they kept hammering away,” said the judges, who commended the tight, “bullet-proof” writing that prompted this serious look at Cohen’s role. “Pioneering efforts and inside-IBM documents revealed the coded language from a major American company that didn’t want old people anymore,” said the judges, noting that the stories led to a U.S. Equal Employment Opportunity Commission nationwide probe of IBM age bias and the corporation’s service line being flooded with requests from former workers seeking details on why they were forced out. The judges for this year’s awards were Dan Hertzberg, longtime financial journalist with The Wall Street Journal and Bloomberg News, Cesca Antonelli, editor in chief of Bloomberg BNA and Paul Steiger, executive chairman of ProPublica. Judges recused themselves from deliberations involving their current news organizations. The awards will be conferred on Monday, November 19, at the Walter Cronkite School of Journalism and Mass Communication at Arizona State University in Phoenix.